The surfer managed to get up on her knees and paddle with her arms to catch a wave. Will she be able to get up on her feet and ride this little wave in to shore? Of course I am able to stretch this little sequence out a little longer. Most parents can remember teaching a child to ride a bicycle by running along side the bike and giving the bike a push so the child can gain his or her balance without training wheels. Today's photo shows what I imagine is the equivalent assist to a person trying to learn to surf. A friend gives her a helpful shove to try to catch a wave. Will this work? As usual, I am stretching this series out to test your patience. The women were photographing a friend who was a beginning surfer, as shown by the fact that she wiped out on a small wave. Will her surfing outing be a success in riding a wave in to shore? The answer, as usual, will be revealed tomorrow and in the days ahead. All photographers have felt the frustration of having a good subject to photograph, but having a problem with the background. Maybe there are too many other people around, or a sign or some other object that interferes with the purity of the subject. i guess there was a problem with the spot where this photographer's friend was surfing, and she wanted to move her to the right. There is a problem with my composition of this photo. The left hand of the photographer is right on the line separating the Tamarindo Bay from Cabo Velas. This violates one of the principles of composition, with is separation of subjects. I point out this flaw in the photo in case it might be overlooked by the very few viewers who might not be focused on her hand. The photographer on the beach was taking photos of a friend of hers who was surfing. Or trying to surf. Maybe we will stick with this little series for a few more days to see if the woman was able to ride a wave in to shore. Lots of people like to learn to surf on Tamarindo beach. There are many surf schools. You can choose whether you want small or normal sized waves because half of the beach is partially sheltered by an island and reef that reduces the size of the waves in the southern half o the beach. Today is Sunday, so we have new photos posted on our Viva la Voyage travel photo site. This week we return to Africa, featuring some classic wildlife images. The camera of a fellow photographer caught my eye, as I showed yesterday, so naturally the technique of the photographer was my exclusive interest in observing how she took photos. She has her left hand on the lens barrel, which is fine if she focusing or adjusting the zoom on her lens. If she is actually taking a photo, however, she should hold the camera by bracing it with her left hand underneath the camera. Holding the camera by the lens barrel is less steady. What was she photographing. Maybe I will show a few more photos of this scene in the coming days. This we we are showing photos of some scenes of the people, markets, and scenery of Tanzania on our Viva la Voyage travel photo site. When I was taking some photos on Tamarindo beach, this other photographer caught my eye. Why? Well, of course, I was interested only in checking out her camera to see what kind of camera and lens she had. I took a few more photos of her and her friend. Steady readers of this blog will know that I often like to post a short series of photos that tell a little story, but I don't know if I will in this case. Hmmm. I wonder if people would want to see more photos of these women. Will I post more? The answer, as usual, will be tomorrow and the next few days. This is the answer of what to do if you can't decide whether to play soccer/football or whether to go to the beach. Why make a choice? You can do both. Looking down at the sand by one's feet while walking along the wet sand under the receding waves of Tamarindo beach will sometimes reveal odd patterns of lines in the sand. These are the trails of a little creature that I presume is a member of the crab family. When a wave covers the sand, the patterns will be washed away, and the process will start again. The creature who created these lines looks like he had too much to drink, as he was unable to walk in a straight line. I do not normally manipulate images. I do not know how to use photoshop or similar programs, although I do have iPhoto and can crop or boost the saturation at times if that enhances a photo. Today I am making an exception. Below is the photo as it came out of my camera, with a washed out background as I was shooting into the sun on the sandy beach. I therefore decided to try to exaggerate the white out conditions by increasing the exposure and contrast and converting it to black and white. This is the same boy that I showed the day before yesterday, as I continued to shoot photos as he rode past me. Just as the boy on a bicycle who I showed the other day prefers the beach to the street, so does this man walking his dog. I am dipping into my archive because I need to reorganize my computer to open up more storage space for photos. I took this photo a few months back, on a cloudy day, as we are now in the dry season, with clear, sunny skies. What does this friendly monkey want? 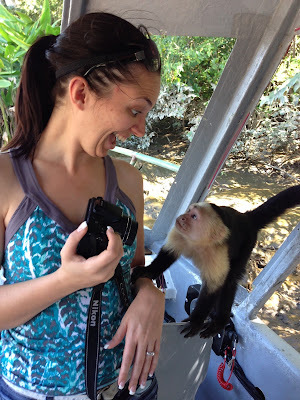 I love this photo of a white-faced Capuchin monkey reaching out to touch and make eye contact with my daughter-in-law. The monkeys knew that they were all out of bananas at this point, so he was strictly socializing, not begging for food. The guide told them that they should not show their teeth to the monkeys because monkeys show their teeth as a sign of aggression. I think it was impossible for Christina not to smile at this monkey who approached and touched her on the arm. I am also sure that this monkey could see her friendly intentions. My son got married the weekend before Christmas, and he and his lovely bride enjoyed their honeymoon in our Langosta Beach condo. My son took this photo during their wildlife river cruise in Palo Verde National Park. Today is Sunday, so we have new photos posted on our Viva la Voyage travel photo site. This week we are showing some photos from Tanzania that feature some of the scenes other than wildlife. I posted a photo a few days ago of the main street of Tamarindo that runs parallel to the beach. With the traffic on the road at times, it is a wise choice for this young boy to ride his bike along the beach instead of the road. This week we have photos showing what a Grand Canyon rafting trip is like, focusing on the camping experience, posted on our Viva la Voyage travel photo site. Playa Langosta is popular with surfers, as you can see in this photo. I had one guest from Barcelona who rented our Langosta condo and he sent me a copy of a photo of himself in the curl of a wave and thanked me for what he described as "epic surfing." After a few days of photos of Tamarindo town, I figured I should show a photo of why most people come to town -- the beach and the surf. Yesterday and the day before I showed photos of some of the shopping areas of Tamarindo, so here is a similar photo. This is the Plaza Conchal Shopping Center, which has shops on the first floor and offices on the second floor. It looks like the man at the right is waiting for his wife to finish shopping. I go to this shopping center every time I visit Costa Rica because it is the location of the Banco de Costa Rica, where people can pay their airport departure tax of $28 in advance of departure and avoid one line and thing to do at the airport. Yesterday I showed the older portion of the main street in Tamarindo. This is the portion of the beachfront road as it travels through the middle of the Tamarindo Diria Resort complex. Across the street from this location is another row of Diria shops, with a new restaurant, nightclub and small casino. I will show a photo of that area in the future, but I need to reorganize my computer inventory of photos first before I can access the most recent batches of photos I have taken. This is a view down towards the old part of Tamarindo. This is the last block of the beach front road before it dead ends into what is known as "the circle." The beach is right behind the row of restaurants and shops on the right side of this photo. This photo shows the atmosphere of Tamarindo having been a surfers' town before the development of modern condos that have turned it into a resort town. There are no condos right on the beach in the main part of Tamarindo because the old shops and restaurants got there first. There are a few condos, such as ours, right on the beach in the Playa Langosta area of Tamarindo, as it is a residential area that was developed primarily in the last 15 years or so. When I posted my photos of the tourist talking to the horseback rider last week, Sharon of Phoenix Daily Photo commented that it looked like there were some people nearby waiting for a bus. Indeed there were, and I had taken a photo of them, which I am posting today. There is good bus service to Tamarindo. Most of the people taking buses are workers who live in nearby towns and come to Tamarindo to work in the hotels, shops and restaurants. These people have suitcases, though, so they may be people from San Jose who are returning after a little vacation on the beach in Tamarindo. One thing Tamarindo does not have, however, are bus shelters for people to sit on while waiting for the bus. I think we need them, but paving more of the streets will probably come first. I just concluded a little series of photos of a man making arrangements for a horseback ride. I wonder what his wife was doing? Perhaps she was taking advantage of the massage tables on the shaded beach front of the Tamarindo Diria Resort. There is no need for a recording of relaxing "spa music" if you get a massage where you hear the ocean surf and feel the gentle breeze coming off the Pacific Ocean. Today is Sunday, so we have new photos posted on our Viva la Voyage travel photo site. This week we are showing a few more photos of my wife's experience on a river raft trip through the Grand Canyon. Julie does not like the rigors of camping, but she endured this 10 day adventure to have the opportunity to take photos of this unique wonder of planet Earth. After the tourist and the horseback rider shook hands on whastever deal they made, the rider and the two horses scurried off, heading down the street past people sitting and waiting for a bus. This week we have photos of the ancient Khmer temples around Angkor Wat in Siem Reap, Cambodia posted on our Viva la Voyage travel photo site. The tourist and the man with a horse, evidently closed deal for the arrangements for the man to go horseback riding. They shook hands on their deal, as shown in this photo. The man did not immediately hop on the white horse. I suspect that they made arrangements to meet at a later time for the man, and perhaps his wife, to go horseback riding. The conversation between the horse rider and the tourist continued, with the rider dismounting. I will show the conclusion of this encounter tomorrow. Although the road to Tamarindo is paved, this photo shows that some of the streets in Tamarindo are still not paved. The beach front road is paved. The main road that leads from the beach to the rest of town is supposed to be paved in part starting this month. The community continues to pressure the local government, which is located 20 minutes away in Santa Cruz, to pave more streets. A political problem is that most of the residents of Tamarindo are foreigners, and the local politicians obviously place a higher priority on their voters, not foreign residents, and there are many other priorities. In the meantime, they periodically spread a coating on the dirt streets to keep down the dust. The coating is derived from the local sugar cane industry and causes a mild and pleasant odor of molasses. When the streets are paved, I will miss the aroma. It is often warm in Tamarindo, and it appears that the horseback rider removed his shirt for the simple reason that he apparently forgot his hat and wanted some sun protection for his head. At least it did not appear that the horseback rider said that he would take off his shirt if the tourist took of his. It also looks like the horseback rider is pointing out directions the tourist. My guess is that the horseback rider sells horseback riding to visitors and he is pointing out suggested areas fort the visitor to ride the horse. People are not supposed to ride horses on the beach in Tamarindo, although every once in a while people do at the far south end of the beach where there are not many people. In the past I posted some photos of a woman in a white bikini horseback riding on the beach, and those posts remain frequent places where readers land on my site based on Google searches that people evidently do for photos of women in bikinis horseback riding on a beach. The search terms that cause people to land on my site are diverse. Another post that people keep landing on is one I did about three years ago that showed the late Michael Landon's former house in a valley near San Jose. People searching for information on Michael Landon apparently find a reference to my post showing his former house. The street encounter between the tourist and the horseback rider evolved to the point where the horseback rider removed his shirt. I don't know why. A possible explanation will be shown in tomorrow's post. 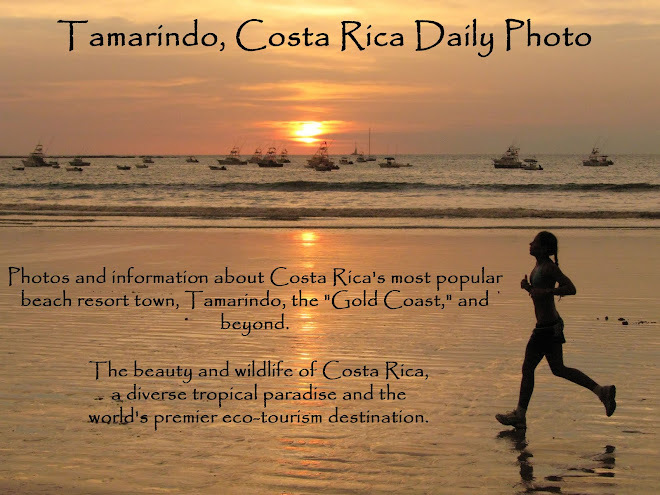 Because I do this Daily Photo website, I have become more observant of people in Tamarindo. I am not sure what was occurring in this encounter between what appears to be a tourist and what appears to be a local person on horseback. I will show a short series of what transpired between these two men in the next few days. This little scene from a farm kitchen is like a rural still life, although I do not know if it is proper to call something a still life if there is not anything alive in the photo or painting. I guess that the wooden caddy is used like a trivet to place the teapot on to protect whatever is underneath. This farm kitchen had only a small wood fire for cooking, so there would be no room to leave the teapot on the grill when other meals were being prepared.. This week we have photos of the ancient Khmer temples around Angkor Wat in Siem Reap, Cambodia, on our Viva la Voyage travel photo site. Here is another photo from a farm we visited. The geese returned from the pasture at then end of the afternoon and made their way back to where ever they spend their nights. This week we have photos of an African photo safari posted on our Viva la Voyage travel photo site. Although the Guanacaste region of Northwest Costa Rica is most known for cattle ranching. goats and other farm animals are also a typical sight. This week I am giving a break from the typical beach scenes that I post, with a few photos of a farm a few miles inland from Tamarindo. I hope this pastoral scene sets a tranquil theme for the beginning of the year. It is traditional for Daily Photo bloggers to post their favorite photo of the hear on January 1. I am not sure if this is my favorite photo, as it is not a typical photo for me, but it is rather attention getting. I used if for the September 1 Theme Day post for the theme of "People." This woman was posing for a photographer who was a few steps away from her at sunset. I "poached" on their photo shoot from a distance and a higher vantage point, which caught her silhouette against the sand and surf, which was reflecting the golden sky of sunset, and also caught her shadowing reflection in the little bit of water on the sand. I trust the woman does not mind my taking or using this photo, as her image is not recognizable.